Review by AllTheBestFights.com: 2018-03-24, pretty good fight between Francisco Rodriguez Jr and Pablo Carrillo: it gets three stars. The former Wbo and Ibf minimumweight champion Francisco Rodriguez Jr entered this fight with a record of 26-4-1 (18 knockouts) and he is ranked as the No.17 super flyweight in the world. ‘Chihuas’ Rodriguez lost to Moises Fuentes in 2015 (Rodriguez vs Fuentes) but then he has won seven consecutive bouts beating Hector Rolando Gusman (Rodriguez vs Gusman), Elias Joaquino (Francisco Rodriguez Jr vs Elias Joaquino) and Ronald Ramos in his last three. His opponent, Pablo Carrillo, has a boxing record of 22-5-1 (14 knockouts) and he entered as the No.70 flyweight. He fought three times last year defeating Carlos Arroyo and Marlon Ahumada but between these two bouts he lost to Ronald Ramos. 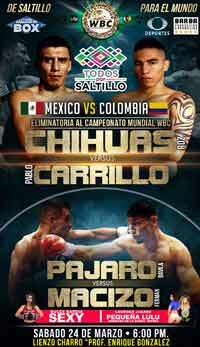 Rodriguez vs Carrillo is valid for the vacant WBC Latino Silver flyweight title. Watch the video and rate this fight!